The first commercial version of the V5 Seabin – an innovative marina-based collector of floating rubbish – was displayed by Poralu Marine in the Marina & Yard Pavilion at Metstrade 2017. The product not only attracted a continuous stream of visitors but secured a much coveted DAME design award in the Marina Equipment category. Seemingly simple but nonetheless innovative and forward thinking, Seabin was developed by two Australian surfers Pete Ceglinski and Andrew Turton. Their awareness of the importance of clean oceans and increasing concerns about marine pollution set them into inventor mode; although not just to create a product but also to launch a philosophy. Seabin, not surprisingly, is a bin that sits in the sea. It is fixed to a floating pontoon, submerged, and connected to a low power electric pump which creates a continuous current to attract floating waste to the collector. The waste is recovered in a bag, which is emptied and replaced by maintenance personnel as required. Each bag has a maximum sensible lifting load of 20kg (44lb). As can be seen in any Seabin video – and the launch video in 2015 that attracted crowd funds for the first year of development has been viewed more than 200 million times – the product is a magnet for all kinds of floating debris. What is less obvious is that, in the midst of the daily rubbish, Seabin captures micro plastics; tiny 2mm fragments of pollutants that are likely to escape most other systems. Designed for sheltered waters in marinas, clubs and ports, the product should be strategically positioned in specific debris problem areas where wind and currents will push the flow of rubbish towards the bin. It should be checked twice a day. A percentage of oil can also be captured with simple oil absorption technology if the catch bag is customised for this purpose. As the technology develops, the amount of oil each Seabin can capture will increase. Recognising that a global problem needs global players, Ceglinski and Turton reached out around the world for pilot partners. 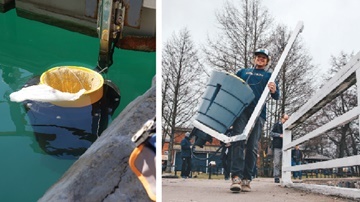 As a result, Seabin has been on trials at Port Adriano (Mallorca); Porto Montenegro (Montenegro); La Grande Motte (France); California marinas under the Safe Harbor Marinas umbrella (with a roll-out planned to all 64 Safe Harbor facilities across the USA); with Butterfield support (Bermuda); and in association with Wärtsilä (Finland). It has also been installed in the Netherlands, Canada, the UK and Cayman islands and, since the launch of the pre-sales campaign in January 2017, enquiries have been received from over 80 marinas in 34 countries. Seabin Pty Ltd is an Australian company; its research and development subsidiary The Seabin Project is based in Mallorca, Spain; and, further to initial meetings at Metstrade three years ago, French company Poralu Marine has been awarded the worldwide exclusivity agreement to manufacture, sell and distribute the product. Now, let’s consider the philosophy. As the inventors and co-founders freely admit, Seabins are not the solution. Only education can work long term to eliminate marine pollution. On this basis, the company has developed an open source education programme based on interaction with or without Seabin technology and has established a solid marine litter research programme in collaboration with top scientific institutions and leading experts worldwide. Seabin itself also plays a part in education by helping researchers gauge the amount and type of rubbish in specific areas. A product that improves the environment must, in turn, be environmentally friendly. Water pump consumption costs around US$1 per day and, as technology develops, this should reduce. It can also be run by solar, wind, wave or turbine depending on the location. The material used to construct the bin is also ecologically sound. “In our company, we use plastic articles to trap plastic,” says Ceglinski. “The Seabins are 100% recyclable and we are currently studying the quantity of recycled materials that can be incorporated into Seabin production.” The aim, he says, is to try to use the plastics Seabin recovers as material for Seabin production. According to www.seabinproject.com, a single bin costs €3,300 plus VAT and bulk order discounts are offered. A fixed dock version of the product should be released this year.